I wish you all a happy day...I've been admiring these cards for a year now - from Night Owl Paper Goods, an eco-chic company. -A complete guide to reading labels in personal care products; you'll be shocked. -A complete guide to non-toxic make-up for the ladies; application tips, product reviews, a give-away and an interview with Canada's leading lady in mineral organic make-up, CEO of LUVU Beauty Tira Wootton. -I'm bringing a guy's view on sustainability to Pure Green - keep posted for a new eco-dude column! -And of course, more from Pure Living, The Organic Kitchen, Style me Green and the Green Traveller. Thank you so much for featuring our noel swag trees wooden holiday card, made from eco-friendly, sustainably-harvested wood! 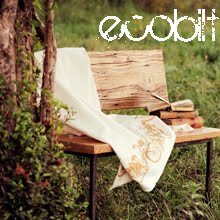 To express our gratitude, we'd love to offer you and your readers 10% off all of our everyday wooden card singles for the rest of 2009! 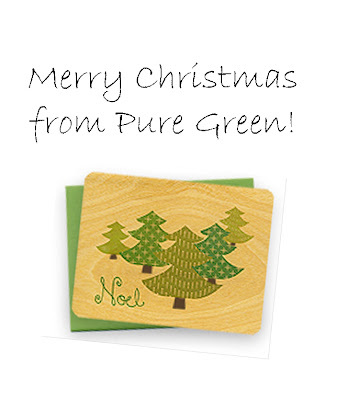 Simply enter the coupon code "puregreen" at check-out. Here's to a pure green 2010! Night Owl Paper - Thank you! How generous and fun! I must tell you I've been crushing after your products for some time! I may just take you up on your offer! I love getting to know and promoting other green business people. Hear Hear on a pure green 2010, and here's to a greener and greener world. The Great Debate - Real or Fake? Welcome to Christmas on PGD!